This incredibly well engineered 25 horsepower aircooled Franklin Series 9b Touring was built in 1919, was sold to Jim Eby’s grandfather, and has been in his family ever since. 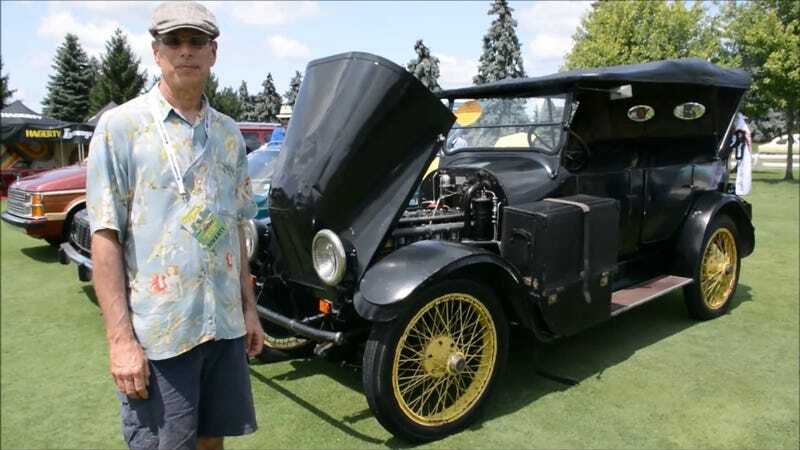 Now, because he’s an intrepid motorist, Jim is driving the Franklin across the United States from one Concours d’Lemons in Michigan to the next Concours d’Lemons in Monterey, California. That’s a very long way to drive a largely obsolete automobile with an open top and just one brake shared among its four wheels. Well, once he’s made the California coast, he’s got to return to his home in Florida. During the Michigan event, Lemons’ own Eric Rood went for a walk around the quite large automobile to get an idea of just how bad this idea was. The car features decades old broken bits, broken or bent wire wheel spokes, a convertible top that has been “fixed” with roofing tar, many scars from its time as a farm truck, and carpeting from Jim’s grandmother’s dining room. At least Jim has a FAST-branded racing-style cool suit for his drives across the extra hot desert. I’m currently at the Bonneville Salt Flats, and the mercury will touch 110 degrees today. Jim is currently in Montana, where he decided that the car’s tires were bad enough to preclude him from venturing any farther. He ordered a new set of Firestone NON SKID tires overnight, and installed them himself. You can follow along with Jim’s adventures via the Concours d’Lemons Facebook page. This is one instance of Florida Man doing something that is equal parts crazy and inspiring.